Ragena Darlene Albrecht was one of 8 children born to Loyal and Marie (Pederson) Woodford. She was born on April 21, 1951 in Eau Claire at Sacred Heart Hospital and raised in rural Fall Creek. She attended elementary school and graduated from Fall Creek High School in 1969. Ragena was united in marriage to Ronald Crandall on October 30,1971. They lived in rural Fall Creek where they raised their 2 children. After her divorce she married Clifford Albrecht on Oct.24,1987 at Bethlehem Lutheran Church in Ludington Township. Clifford and Ragena lived most of their married life just north of Fall Creek on 150th. Avenue. Throughout the years Ragena had worked 17 years as a bartender at Jan’s Place in Fall Creek and as the neighborhood Mom, keeping all the neighborhood kids in line. She had also worked at the Maple Manor in Eau Claire. But her most important job was being a wife, mom and grandma, she never missed a birthday, anniversary, holiday, concert or sporting event the doorwas and will continue to be open. 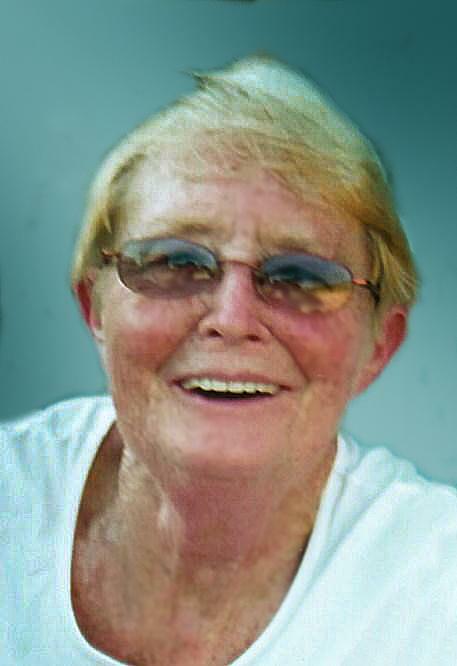 Growing up with her 7 siblings she knew the importance of family values and that continued through to her husband, children and beloved grandchildren. She cherished the time spent with all of them and was also fond of the many pets she had through the years. If you knew Ragena you knew what a loyal and steadfast fan she was of the Green Bay Packers. Ragena will be deeply missed by Clifford, her devoted husband of 31 years; son, Brad and Jen Woodford of Fall Creek; daughter, Kim and Jason Schmid of Fall Creek; 2 grandchildren, Brenda and Cody Schmid; 2 brothers, Don and Betty Woodford, Lyle and Laura Woodford all of Fall Creek; 3 sisters, Carol Huff of Fall Creek, Joyce and Tom Gerdes, Joanne Linder all of Red Wing, MN; Clifford’s sibling, Arvella Howieson, Darlene and Don Schlegelmilch of Eau Claire, and Shari Albrecht of Fall Creek: several nieces, nephews, other relatives and many friends. Ragena was preceded in death by her parents; and siblings, Roger and Linda Woodford, Bernice and Leonard Dekan and Ken Huff. Vernie and Mary Albrecht, Vic Albrecht. We would like to thank the doctors and nursing staff at Sacred Heart Hospital who have fought side by side with this strong woman! For two years you have always been there when we needed you it was comforting knowing that you love her as much as we do. To Dr. Tana at Marshfield clinic no words can describe how much we appreciate what you have done for this family thank you for all that you do. St. Joseph’s Hospice care thank you for your loving support over the last three weeks you are a special group of individuals. A celebration of life will be held on Saturday January 19,2019, at Anderson’s Funeral Home in Augusta Please come in causal dress and we are encouraging Packer attire “GO PACK GO”, lunch and family time will be at Kim and Jason’s house in Fall Creek following graveside service.